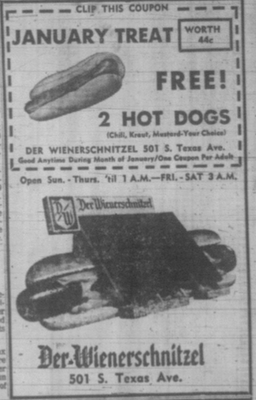 The Wienerschnitzel (called "Der Wienerschnitzel" in the early days) on Texas Avenue is definitely a relic. 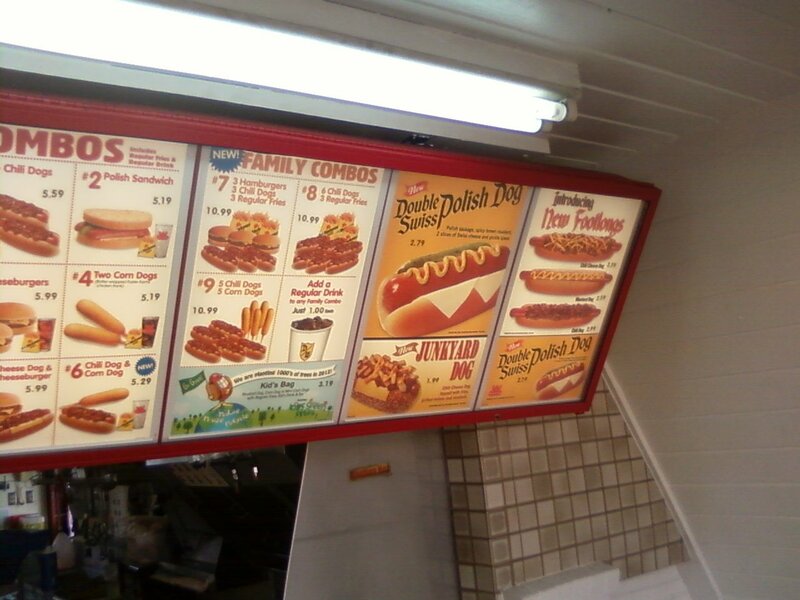 That is a good thing: there are simply too few A-frame Wienerschnitzels left in the wild. I don't know this particular restaurant's opening, but I saw it in local newspapers (The Eagle, of course) back in the early 1970s, and this type was no longer built after 1973. 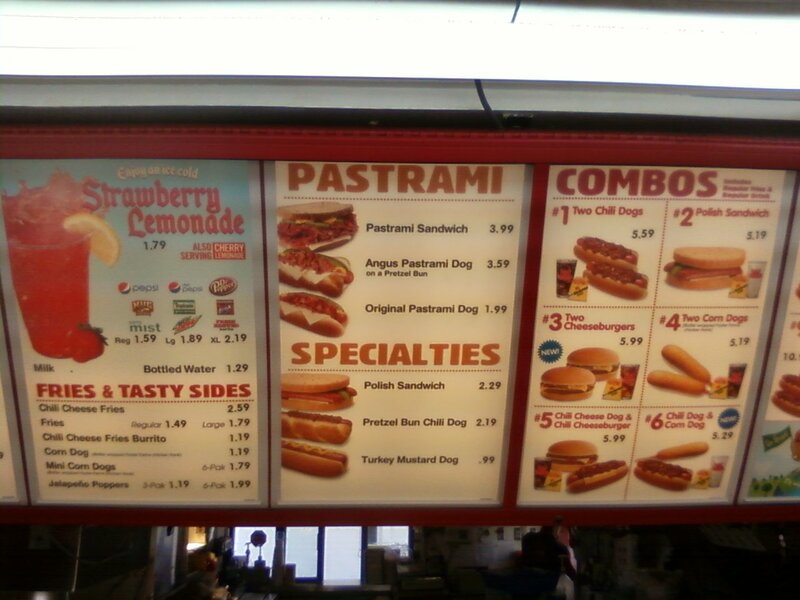 There's no interior seating (only a few concrete seating benches inside), the drive-through is low and narrow, the storeroom is accessed on the other side of the store (they load food supplies in the second level), and it's slightly overpriced for a hot dog, but it's AWESOME. 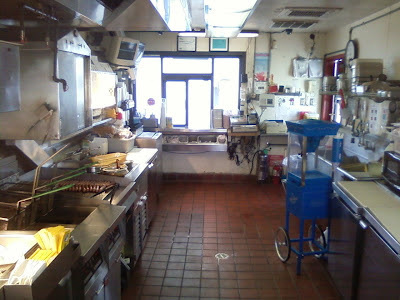 I even got a shot of the kitchen when no one was working there. There used to be a Wienerschnitzel in College Station, near Walmart but it no longer exists. EDIT July 8: It is quite possible that this is the oldest continuously operating restaurant in Bryan, but there's Pepe's, and Martin's, operating since maybe the 1940s. Although since Martin's is sometimes closed seasonally, I guess it could arguably be Pepe's. 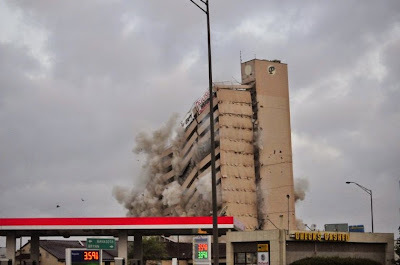 EDIT May 12, 2013 - Updated to new format, removed then-current preview materials, one of which alluded to the Northgate post, and a "barrage of material for the fall", which amounted to about a dozen posts in varying quality. Editor's Note: The reason this post is what it is has been due to a change in formatting. 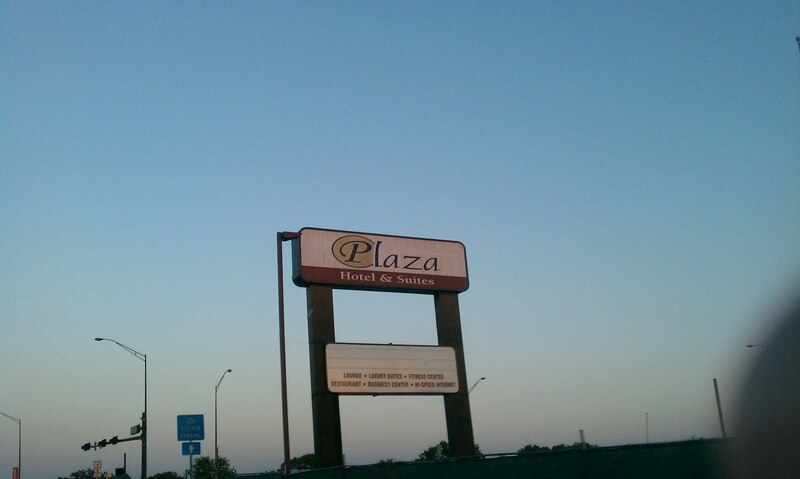 It was formerly known as "Tales of Defunct Restaurants IV", and originally featured others. Crazy Cajuns' can be found on this page. with Souper Salad at Culpepper Plaza's page. Jin's will come back soon. 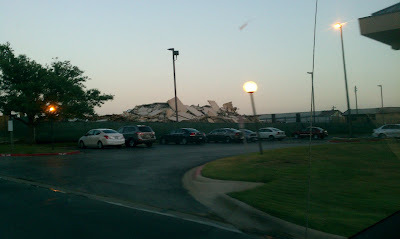 What was later a strip center with the restaurant in the next entry, LJS's resembled the one in Bryan further up Texas Avenue, except it had a problem. It was shut down circa 2004 when it was discovered it was a front for a drug operation (not like the Gumby's, which only looks like one). A few people remember it besides me, but I can't remember the newspaper article. Doc Green's, a soup/salad/sandwich chain out of the Atlanta area, made its first stand in Texas here in late 2007 (and in Austin a few months later). Unfortunately, neither one did particularly well. The Austin one closed up in less than a year due to back taxes being owed, and the College Station one puttered out within a few years. The space is now a sushi bar Naked Fish, which tends to get lousy health reviews. I vaguely remember Mazzio's. 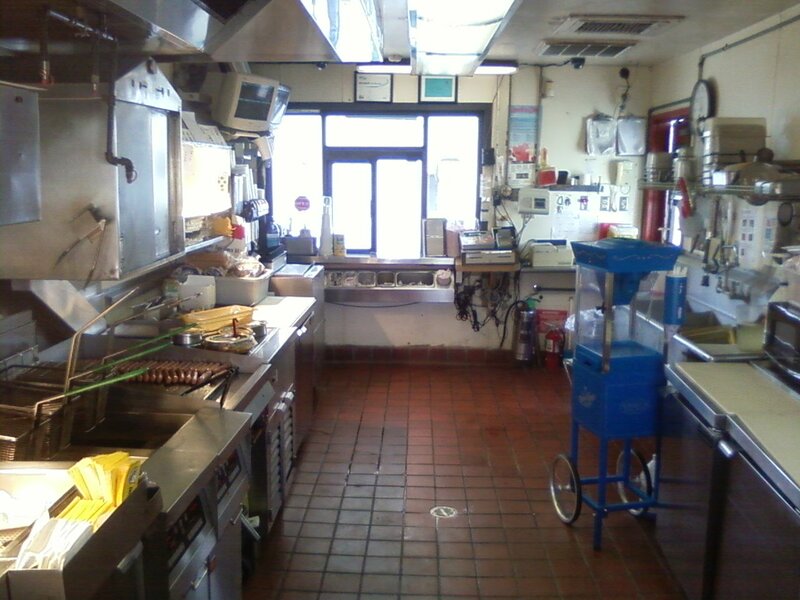 It was a pizza/Italian place that closed around 1997 or so, after only staying in business for about ten years. I haven't seen too many Mazzio's lately in other areas, but Mazzio's was replaced by local place Harvey Washbangers, which has stayed in business since at least 2001. Washbanger's main gimmick was doing laundry while eating, and surprisingly, through some ups and downs, is still doing well. The current incarnation is known for craft beers and good, often unique, hamburgers. Around 2011 or so, a new commercial building was built behind the existing buildings, but only holds a generic "DIY Dogwash" and the new location of SysTek (formerly located next to Doc Green's/Naked Fish), which became a cash store. The commercial building at Park Place and Texas Avenue also holds a Verizon. To the north is another strip center that used to hold a Blockbuster, and now holds a used video game store (which I do like), Yogurtland, and a few other service-oriented tenants. The space on the left (Game X-Change) used to be Texas Avenue Cigars, which moved not too long after its owner, Jess Fields, became a councilman on the city. The strip center appears to be built at the exact same time as Mazzio's, as the brick and awnings are the exact same. The Harvey Road/Texas Avenue stoplight is not quite elevated over Wolf Pen Creek, but it's close. 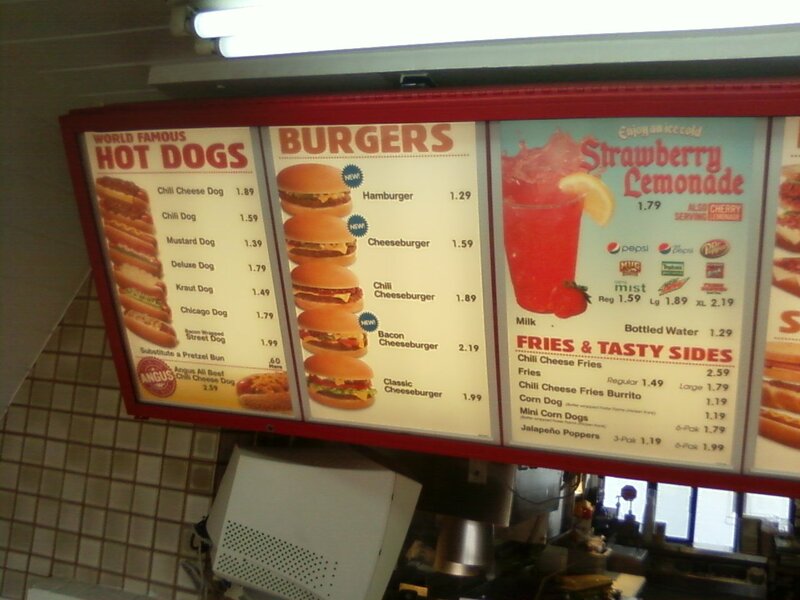 At the southeast corner is a church, the northwest corner is JJ's Liquor. 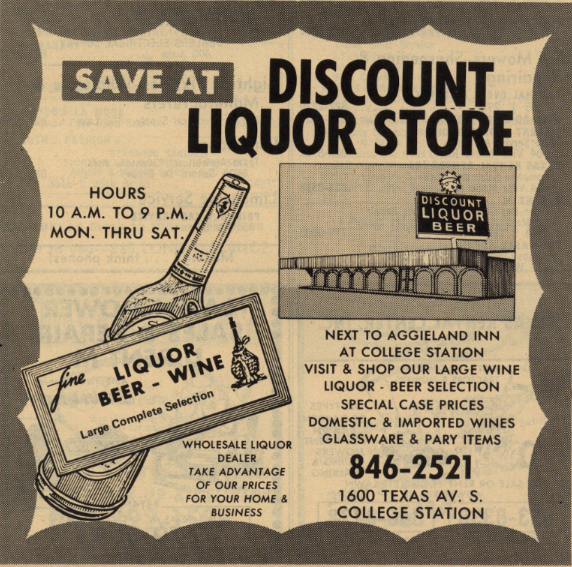 The JJ's Liquor has been in operation since the early 1970s as simply Discount Liquor Store. JJ's bought it in the late 1970s or early 1980s, and even today, under its current owner, Spec's (which kept it open, despite a nicer, newer, and larger store across the street), it still looks very much the same as it did before. Southbound on Texas Avenue, March 2014. Southbound on Texas Avenue, March 2014. Another view.